SKYRC LiPoPal is a simply used battery checker and self voltage balancer. When we are flying or running outside, it is difficult to know the remaining capacity of the battery. With this tiny LiPoPal we could check the voltage of each cell and the remaining capacity in percentage at anytime and anywhere. As we know, if each cell of the battery pack is balanced, the battery performance will be much better and the cycle life will be longer. But sometimes, we may don’t have time or tool to balance the battery cell. With this small kit, when it detects the pack is not balanced, it will start work to balance the pack cell at once. The LiPoPal can check the voltage of each cell of a lithium battery pack and remaining capacity in percentage %. This program can equalize the individual voltages to their lowest one. Balance operation automatically starts about 5 seconds after the battery pack is connected. When the voltage difference between cells over 0.02V, the balancer will start to work. The corresponding “V” will be blinking when it is balancing. 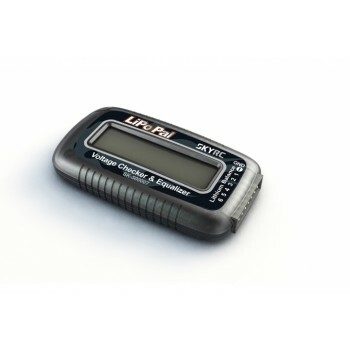 When the voltage difference between cells reaches 0.01V or less, balance operation ends and the device enters the sleep mode and “SLP” will be displayed on the LCD. Simply connect the battery pack to 7 pins connector (XH type). Please note the negative lead or pin of the LiPo connector should match the “Negative” marked on the shell of LiPoPal. After the LiPo is connected, the LCD display the voltage of each cell and the built in balance will check the voltage. If the pack is not balanced, the balancer will start working.